Climbing trip to Orvakal on Sunday, the 24th was fabulous. This trip is distinct for various reasons. 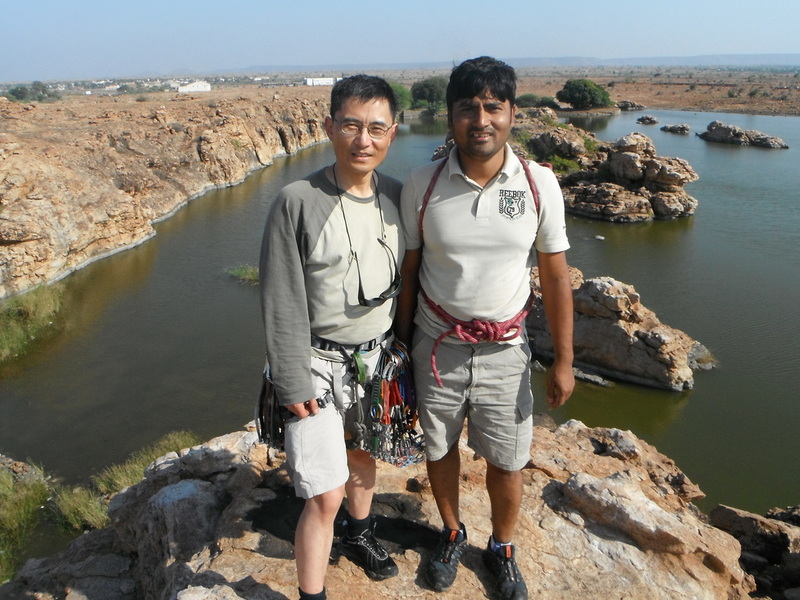 One - we have Xiaoping Li joining us for trad climbing and Santosh, one of the strongest climbers in Hyderabad Climbers eager to get his hands on Orvakal rocks. We started in the evening on Saturday to reach there by about 8 pm, crash to bed in APTDC hotel in Kurnool for good night rest. 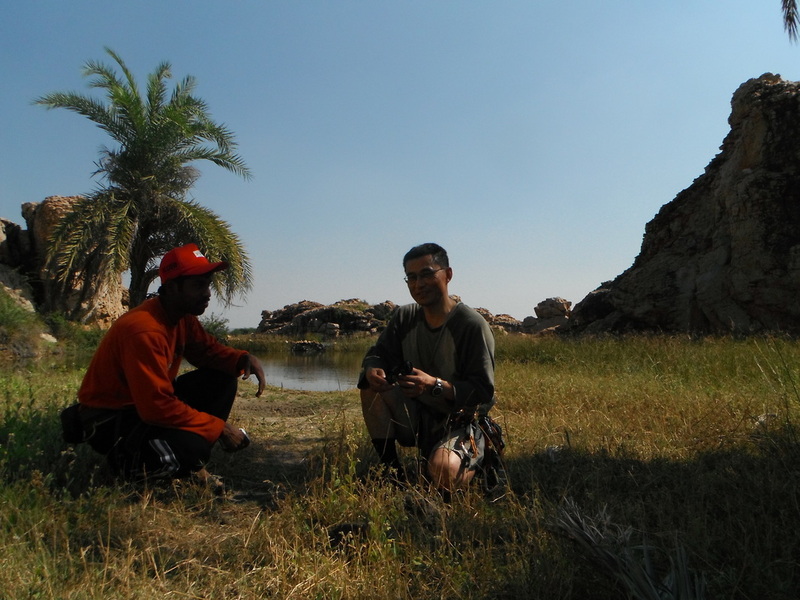 On the way to Kurnool, we had a short break at Drive-in Restaurant for a quick snack and a good tea, then a stop at a hill for a short hike to see if there is any potential trad route. Most of them seem good for top rope instead. Got up early on Saturday at 4:30, headed south to Orvakal by 5.15 AM. Stopped on the way for a tea at local place and reached Orvakal before sun rise. We waited there for a 15-20 mins for sun light to come out. We shouldnt have forgot to get our mosquito repellent creams - those mosquitoes were damn hungry :(. Since none of the routes were climbed by anybody, or at least not known to have climbed so far, we set out to test waters with an easier trad route with ample space to rest feet and with good crack to place protection. We stopped at a longer crack, probably about 20-25 ft high. Xiaoping named it LI with a grade of 5.2+ for trad. It seemed very easy and I could see Santosh grumbling to get his hands on a harder sequence. Route: LI 5.2, Grade: 5.2(trad). We moved further to find our next problem. Two problems sighted, one tall and easy and the second, little short and hard. First we decided to the tall and easy and then get to the harder one. Xiaoping lead this one as well. Followed by Santosh. This is about 40ft high. Location: Monkey Wall, near the lake to the left side. Then comes the route of the day that drained everybody's energy. I tried my hands on it as well to lead it but finally all of us climbed on top rope. Xiaoping attempted to lead, managed to place first protection. Then Santosh tried to add-on with an extra reinforcement for the first cam. Several attempts between me, Xiaoping and Santosh totally drained our energy. Took a lunch break, got back to with a top rope plan. Xiaoping couldnt resist giving more tries for trad and he finally succeeded. In 35 C heat, this problem drained us completely. 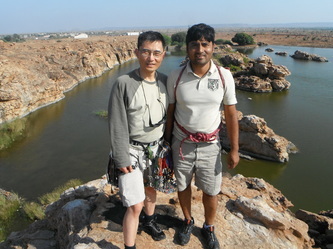 Second and third: Santosh, Ranga. Location: Right beside RV, on the left side near the lake on Monkey Wall. After sandbag, we all looked for sunshade or we were going to call it a day before I spotted a route on Lovers Wall on top rope. 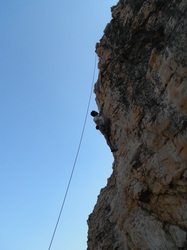 Xiaoping setup top rope anchor. This route is right opposite to RV/Sandbag, more close to water. After this, we called it a day! I have been wondering for a long time about how the accessibility of the boulders can be exposed to the climbing community all over India. 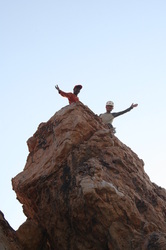 The thought to host a climbing competition has been taking rounds in the leadership team for almost 6 months. With the recent success of conducting Hyderabad Triathlon and volunteer commitment had taken us one step forward to initiate Championship. It all fell in place nicely with IMF pitching in to support this competition. I remember earlier(2010) competition held in Hyderabad when GHAC volunteers turned up in good number to help the organizers locally. 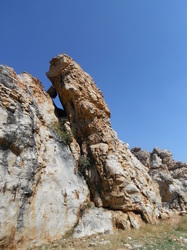 We did not have any climbers from Hyderabad participating in the competition due to sheer lack of awareness to the sport. 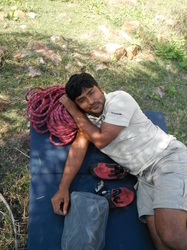 All the hard work that went into Hyderabad Climbers over last three years now has changed the climbing picture altogether with close to 30 regular climbers in Hyderabad, some of them are participating this year and others volunteering to organize the event. Hyderabad Climbers & GHAC is looking forward to host national climbers in Hyderabad. I am sure everybody will have a memorable experience. Competition date: Dec 2nd, 2012. 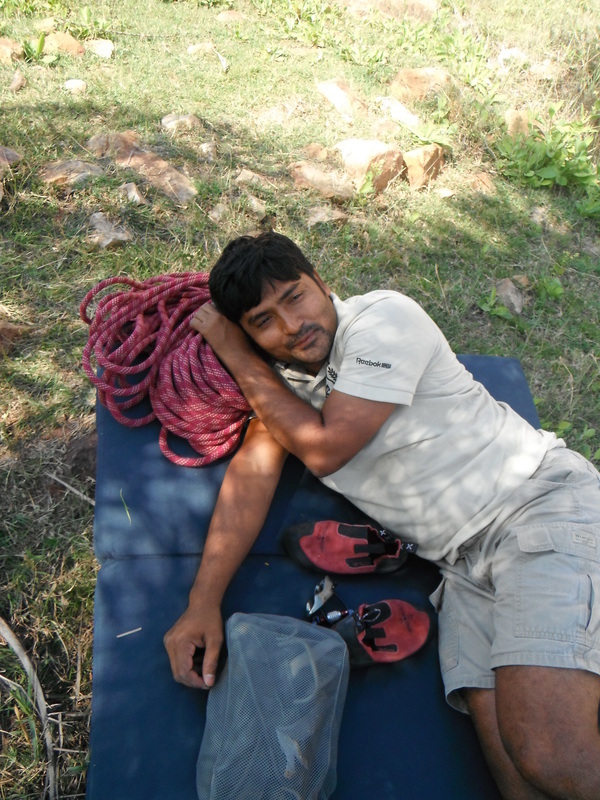 Hyderabad Climbers is a climbing group powered by Great Hyderabad Adventure Club(GHAC). GHAC is a Not-for-Profit organization registered under section 25/c of Indian Companies Act.